FILE - Debris remains from an Ahmadi mosque that was demolished by an angry mob on May, 24, 2018, in the eastern city of Sialkot, Pakistan,Sept. 27, 2018. Pakistan's Ahmadi community fears a renewed sense of religious intolerance and discrimination with the recent removal of an Ahmadi economist from the new Economic Advisory Council after the government relented to pressure by Islamist groups. Atif Mian, a well-known U.S.-based economist, was picked last month to serve as adviser to Prime Minister Imran Khan to help devise new policies in the face of growing economic pressure and increasing debt. Several religious parties publicly opposed the appointment of an Ahmadi to a key government position. 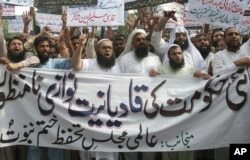 FILE - Pakistani Islamists protest the appointment of a minority Ahmadi Muslim as an adviser to the government, in Lahore, Pakistan, Sept. 7, 2018. Ahmadis, a religious minority in Pakistan, have long felt marginalized, targeted and discriminated against. The ouster of a high-profile figure like Mian created a new sense of hopelessness. Many say if Mian with his international fame could be brought down by pressure from religious extremists, ordinary Ahmadis have little chance against ongoing discrimination. Amjad Khan, national director of public affairs of the Ahmadi community in the United States, told VOA that Mian's removal has generated a renewed sense of persecution among Ahmadis living inside and outside Pakistan. "This whole episode of removing Atif Mian and the government giving up to the rhetoric of the Islamist parties is disappointing," he said. "And it regenerates our fears as a minority in Pakistan. This is about basic citizens' rights in Pakistan." Ahmadis consider themselves Muslims but do not believe that prophesy ended with Prophet Muhammad. They view Mirza Ghulam Ahmad, the 19th-century founder of the Ahmadi movement, as their messiah. Pakistan's constitution does not recognize Ahmadis as Muslims. The dilemma Ahmadis face is that they could be accused of perjury if they fail to declare their faith, and could be singled out and discriminated against If they do declare their faith. "For the past 26 years, I've constantly faced questions regarding my faith at work. I was accused of being a blasphemer. I was called kafir [infidel]. I was given the worst possible treatment because I'm an Ahmadi," a Lahore-based pharmacist told VOA on condition of anonymity. Obaid Ali — an alias used by an Ahmadi electrical engineer in Punjab province — said he lost hope after seeing the government give in to the wishes of extremists. "The way the Pakistani government treated a world-recognized economist is a shame within itself," he said. "The way Islamists are still able to dictate to the government is alarming. And the way the media stays quiet is painful." Ali added that despite the laws, the "whole system of this country, unfortunately, is against the minorities, and especially the Ahmadi community." He said Ahmadis are not allowed to serve in government posts. "They are not even allowed to call themselves Muslims. This is unfair," he said. Some analysts in Pakistan believe the removal of Mian's appointment has conveyed the "wrong message" to the world. "The problem with this country is that we connect everything with religion," Mehdi Hasan, a human rights activist and an analyst from Lahore, told VOA. "I am unable to understand why the government had to take Atif Mian's name back because of pressure from the Islamist groups," he said. "Atif Mian had to serve as an economist and not as a religious scholar. So, what was the clash?" Many Ahmadis, including Mian, say despite constantly facing discrimination on the basis of their faith, their sense of patriotism is still strong and they will continue to serve their country as Pakistanis. "No one can challenge our patriotism for this country. You can stop us from posing as Muslims, but you cannot stop us from loving this country. I'm a Canadian citizen, but I opted to stay in Pakistan," the Lahore-based pharmacist said. When asked to step down, Mian reacted calmly. He said he was ready to "serve Pakistan, as it is the country in which I was raised and which I love a great deal. Serving my country is an inherent part of my faith and will always be my heartfelt desire." The Ahmadi minority was declared heretical in 1974 following pressure from religious parties. Its designation in the constitution that year as a non-Muslim group has since led to its members being persecuted and accused of violating the country's controversial blasphemy laws. "A person who does not believe in the absolute and unqualified finality of the Prophethood of Muhammad [Peace be upon him], the last of the Prophets, or claims to be a Prophet in any sense of the word or of any description whatsoever after Muhammad [Peace be upon him], or recognizes such a claimant as a Prophet or religious reformer, is not a Muslim for the purposes of the Constitution or law." FILE - Pakistani volunteers collect debris from an Ahmadi mosque demolished by an angry mob, in the eastern city of Sialkot, May, 24, 2018. Targeted killings of Ahmadi members and leaders in Pakistan are common, and the community regularly faces hatred and social discrimination. 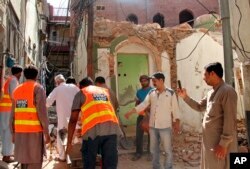 Earlier this year, Islamic fundamentalists in Pakistan demolished a century-old place of worship for Ahmadis in the eastern city of Sialkot. Last October, three members of the Ahmadi community were sentenced to death on blasphemy charges in Punjab province. Last year, thousands of supporters and members of Tehreek-e-Labbaik Pakistan (TLP), an Islamist party, gathered in the Pakistani capital of Islamabad, paralyzing it for weeks. They accused the government of committing blasphemy over its attempt to modify a parliamentary bill related to a "Khatam-e-Nabbuwwat" oath that affirms the end of prophecy with Prophet Muhammad. TLP alleged that the government favored Ahmadis by dropping the oath as a requirement. The sit-in ended after the military intervened and convinced the protesters that the planned modification would be dropped.